This item consists of 10 used:Original AKM pistol grip in overall good condition. If you buy this item you get one used bakelite pistol grip. I cant identify origin 100%. These are on the dark brown, dark brownish /red color side of Polish Bakelite, compared to the lighter redish/orangish colored ones. These are the darker colored ones. 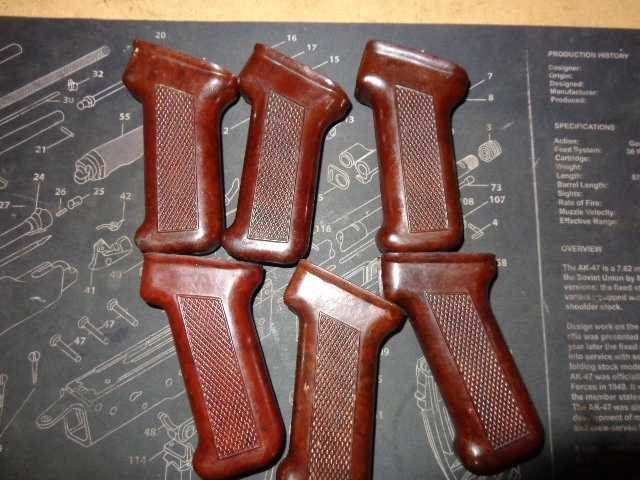 Polish Bakelite Ak pistol grips are fatter and diamond patter faces outward,and Romanian bakelite grips are thinner and diamond pattern faces inside. expect these to be dirty, and have nics and scratches, some may have names carved in them. I am grading thee grade 3, good overall condition, will show wear form years of use and needs to be cleaned. I do offer hand picking for $5. I grab 5 and pick the one I think looks the best. Every Bakelite grip is unique the condition of these is pretty much the same good to verygood, however, the patterns are unique and some look better than others. These also clean up pretty well to with Simple green and 0000 steel wool. Each bakelite grip looks to be unique. Most could use a good cleaning for sure. These are used and show wear from years of use. The color and shades vary on these, none are exactly the same. The bakelite pattern is random and varies from grip to grip. The grip styles and grip pattern vary as well. these have have nics scratches and dings. These are grade 3 condition, Good overall condition. these can likely be cleaned up good with simple green and steel wool and be restored. Most are brownish color, kind of dark, some dark reddish-brown. Color/shades vary.